For users of LiveLink™ for SOLIDWORKS®, COMSOL Multiphysics® version 5.2a makes it possible to connect to COMSOL Server™ from within SOLIDWORKS®. 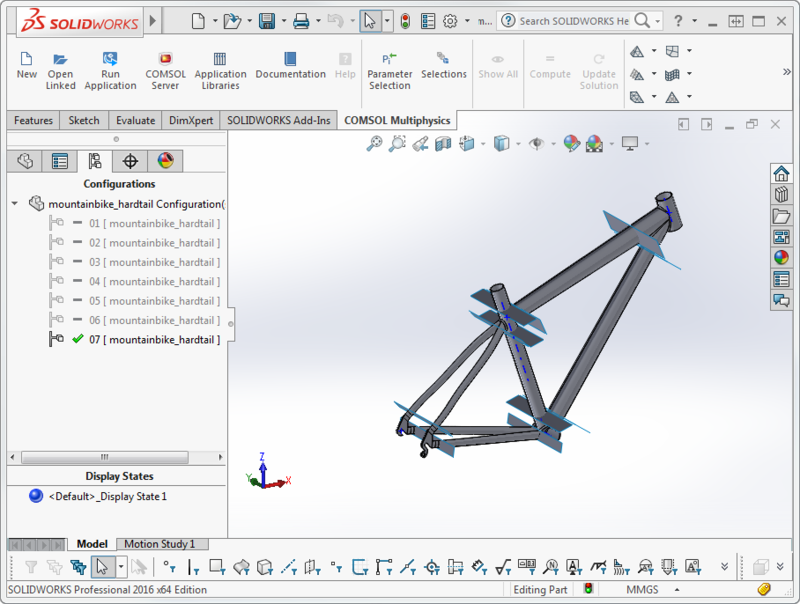 You will also find an example that shows how you can build an app that lets users modify the SOLIDWORKS® geometry from the app directly. Review all of the LiveLink™ for SOLIDWORKS® updates in more detail below. When you have installed COMSOL® Client, a button will be made available for connecting to COMSOL Server™ from within SOLIDWORKS®. This means that you can browse and run apps from within the SOLIDWORKS® interface, including those that use geometry synchronized with SOLIDWORKS®. The reliability of a bike frame can be estimated by analyzing the structural stress subjected to different load cases. This app leverages LiveLink™ for SOLIDWORKS® to interactively update the geometry while computing stress analyses. Using this app, you can easily test different configurations of a bike frame for different cases of dimensions, material, and loads. 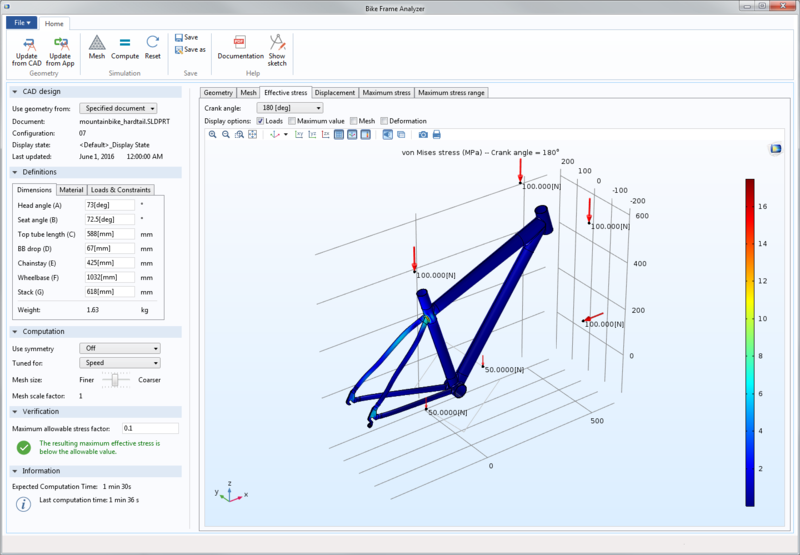 The app computes the stress distribution and the deformation of the frame, based on the structural dimensions, materials, and loads/constraints of the bike frame. To easily keep track of the analyzed CAD design when the geometry in the app is updated from a SOLIDWORKS® document, the app displays CAD file information, such as the date and time of the last update, as well as the document name, its configuration, and display state. You can manipulate the frame geometry's dimensions, such as head angle, seat angle, top tube length, base bottom drop, the chainstay, wheelbase, and stack. You can also define material properties to be aluminum, steel, titanium, or something that you specify. Load cases and constraints can also be specified. The app allows you to set a maximum allowable stress factor where a control value for the effective stress is computed for a given load case. 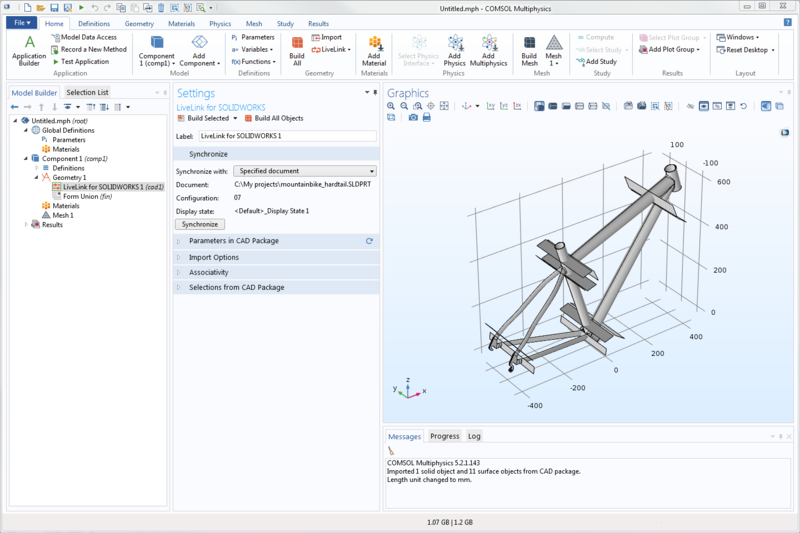 NOTE: In order to run this app, you need both LiveLink™ for SOLIDWORKS® and the Structural Mechanics Module. In order to prevent synchronization with an incorrect SOLIDWORKS® document, the LiveLink™ interface now keeps track of the file name and path, as well as the configuration and the display state of the synchronized SOLIDWORKS® design. During the first synchronization, the file name is retrieved and documented. For subsequent synchronizations, the interface automatically selects the same file in the SOLIDWORKS® software, as long as the file is open there, and automatically switches to the previously synchronized configuration and state of the design. 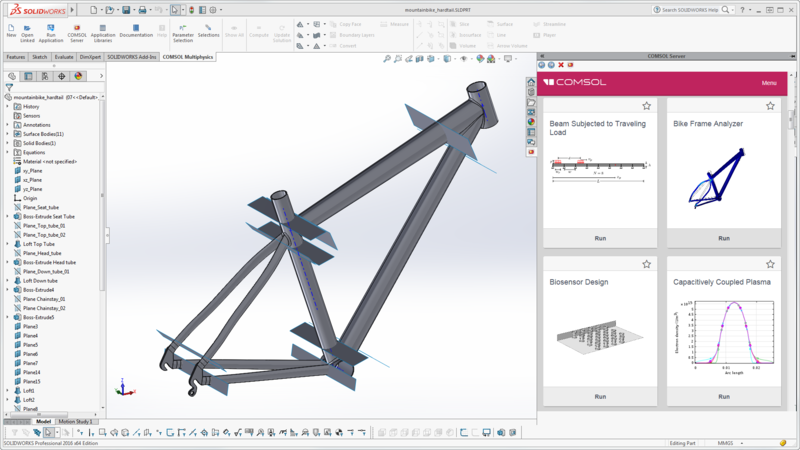 This bike design in SOLIDWORKS® has several configurations and one display state. After synchronization, the configuration and display state are shown in the Settings window for the LiveLink™ for SOLIDWORKS® node. During future updates, the interface will automatically synchronize the first synchronized configuration, even if another configuration is active in SOLIDWORKS®.